The first ever S90 stepped into the world back in 1996 however the Volvo S80 2014 took over the model for a while. Well these all are the old fables and today we have a stunning model standing beside with luxurious interior that comes filled with tech features. 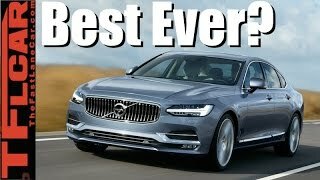 Let us have a look at the review of Volvo S90 2017 to know about the specifications and features of the model in detail. The interior of Volvo S90 2017 resembles a lot with the recently seen XC90’s cabin. However there are certain integrations in the door panels and dashboard that makes the model stand apart. Beside the gorgeous three-spoke steering wheel the dashboard is housed with a Massive Sensus Connect touchscreen. The dashboard is designed slim and has large wood inserts with tall AC vents and very few dashboard buttons. The door panels get bit of change with the wooden trim. Apart from these the center console, seats and steering wheel gets the similar look. Apart from these the interior also brings lots of space with it, thanks to its extended wheelbase that makes the space roomier for the rear passengers also. 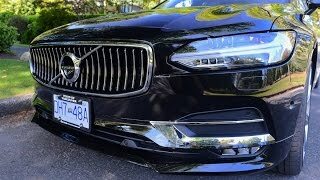 In all rounding up the interior details of Volvo S90 2017 I would just say, it’s a lap ahead of the rest in its class. 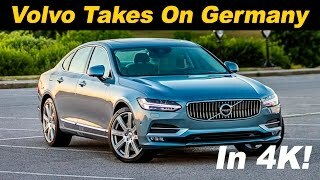 Just like the interior, exterior of Volvo S90 2017 finds resemblances with the XC90. Starting with the front fascia let us talk about the changes which make this look distinct. There is a newly designed grille amidst the headlamps which are integrated with the LED daytime running lights. The latter are designed in Thor’s hammer shape and add to the sportive appearance of the model while beneath the setup is a redesigned bumper with wide intakes and a splitter like element. Moving towards the rear portion of the car, along the sides you’ll notice a coupe-like profile because of the roofline and longer rear windows. The rear end has sportive bumper borrowed from the S80 and cleaner designer trunk lid with ‘Volvo’ engraved in big letters between the taillights. 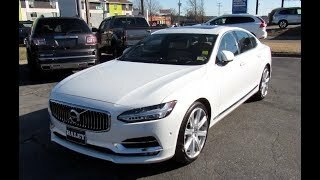 In all the exterior of Volvo S90 2017 is sleek, sportive and elegantly designed piece of architecture. 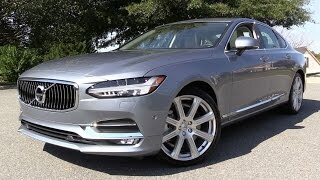 The powertrain of Volvo S90 2017 is not yet shared but company do told us that the drivetrain will be borrowed from the XC90. One must not be surprised with this as the other two sections are also borrowed from the same SUV. However this implies that the model will be available with T6 and T5 petrol engine and D4 and D5 diesel engines. The performance figures and output details of Volvo S90 2017 are not yet shared and it’ll be tough to speculate them as of now.